Have you ever wondered what it would be like to explore a secret government research facility inhabited by sentient corn and a angry russian robot teddy bear named Vladdy; all created by a Donald Trump impersonator? Maize has got you covered... or at least it does for a short while. Disclosure: Press copy of Maize provided by developers. 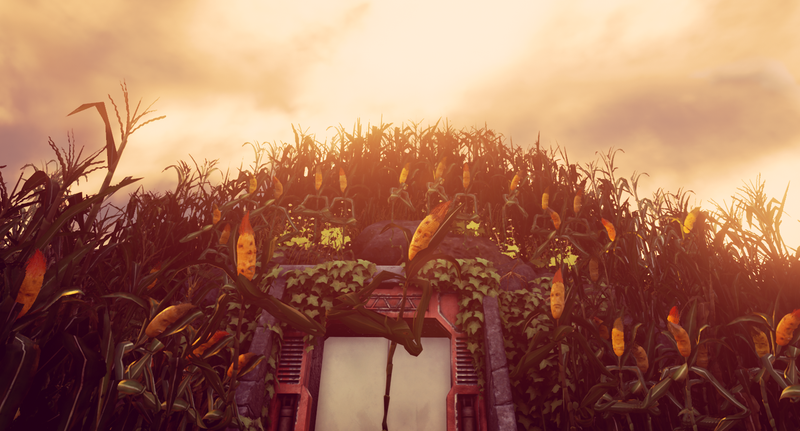 Maize is a first-person point and click adventure where you, the silent protagonist, go on a quest to do everything that hypersomniac, sentient corn tell you to do (namely save their “queen”), which is clearly the best idea when you wake up with no memory in a corn field. The game has a ton of extremely easy puzzles, but entertain you plenty so the lack of a challenge can be looked over. The game banks most of its appeal on its comedic writing, which for the first two thirds of the game its genuinely worth your time. The game has an interesting way of kiting the player to continue the story. The only hobby the corn have is stacking orange boxes I guess. Without spoiling too much of the story, as there is very little story, I can say this game played more like an experience than a game. The game has a great sense of humor, with many jokes being completely unpredictable and pretty clever. You spend the length of the game solving puzzles whose importance is incredibly unclear, albeit entertaining thanks to the writing alongside the puzzles. You collect valueless items that contribute to the backstory of the facility all with funny descriptions. These items include documents, excersise equipment, a whole water cooler and... rocks. Literally rocks. Clearly the devs wanted collecting useful items to be a big part of the experience. Speaking of collecting items, the facility’s entire backstory is told through these items and little pink and blue sticky notes found around this facility. The facility was apparently run by a pair of “scientists” who turn out to be wholly incompetent and completely incapable of running a government-funded facility. You never meet these characters but the story behind the sticky notes is hilarious and makes you want to push on in the game just to learn more about what happens to the two. To put it simply, this part of the game appears to be some kind of political commentary on the United States government. The man depicted by the life sized bronze statue above (named Bob) is a blatant clone of Donald Trump as the image above already suggests. The other individual, clearly overshadowed by Tru-I mean Bob in the right side of the above image (named Ted) is an intellectual who spends the entirety of the game complaining about the wholly incompetent use of government funds by Bob, but never actually does anything, doing his best to avoid any actual contact with Bob. I though this strange inclusion of modern politics as a joke was incredibly entertaining, and it never gets in the way of the story. The 4.5 million dollar bathroom commissioned by Bob. Truly a lavatory fit for a president. A third of the way through the game, you reassemble a robotic teddy bear by the name of Vladdy. Vladdy is Russian, and therefore spends the entire game calling everyone else an idiot, insulting poor American craftsmanship in the facility, and fixes machinery by hitting it really hard. For some, Vladdy’s insult humor may be fun for a while, but for others he might be incredibly annoying as many I’ve met. A lot of his value as a character is in the concept alone. Speaking of undercooked ideas, a small part of the game’s comedy is through little text notes on the screen. These can be pretty funny as they’re far and few inbetween, but ultimately feel like a last minute addition to throw in some extra jokes or move the plot along. A narrator in the style of Stanley Parable telling these jokes would have worked much better. Now, the truly sad part of this game is the price and length. As of this publishing, the game costs 20 dollars US (or your regional equivalent). That sounds around fair for an indie game, until you find out about the length. I completed the game in 3 hours. 3 HOURS. For a game that costs 20 dollars, I would normally think a playtime of 3 hours without any kind of challenge is a preposterous idea, but having received it for free I think it was completely worth it, so maybe picking it up on sale isn’t a bad idea. If you have 20 dollars and want to buy a comedic point and click game, look to Tesla Effect: A Tex Murphy Adventure if you haven’t already. Its a phenomenal game which provides a challenge in its puzzles and a great laugh all the way through, and most of all its over four times longer than Maize. Now if you do decide to pick this game up, save it for an evening when you feel like kicking back and enjoying a light but still fun experience. This isn’t close to a game changer for First-Person Point and Click games, but its not a title I’d object to. If your cash is burning a hole in your pocket and you’ve played every other point and click imaginable, definitely pick this up.